The Cerex FT5000C and FT5000CRM are multi-gas FTIR analyzers suitable for continuous emissions monitoring, process monitoring, RATA, Quad J and Quad Z compliance monitoring, and ambient air monitoring applications. Features a wall mount NEMA enclosure and thermo-electric air conditioning for outdoor or indoor operation. Optional hazardous location hardware allows operation in Class 1 Division 2 Groups A-D areas. Features a rack mount, air cooled enclosure suitable for installation in temperature controlled cabinets, mobile laboratories, laboratory benchtops and intermittent portable stack testing. 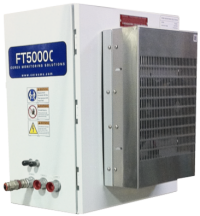 All models are available with heated sample cells and heated sample tube controllers for Hot and Wet operation.